Tokyo-based heavy electro unit, Vanished Empire, are set to release their new album, The Unnameable Symphony, on December 13. The album concept focuses on the myth of of Cthulhu and includes nine tracks – five songs plus four remixes by other artists. 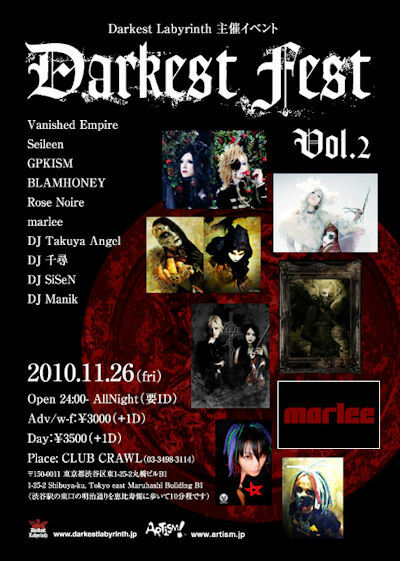 There will be a release party for the new album at the Darkest Fest event to be held at Club Crawl Shibuya on November 26. This promises to be a great album with powerful vocals from DJ Chihiro and the musical genius of 2 Bullet’s Dee Lee on programming and keyboards. The album will be released on the Darkest Labyrinth label which has quickly developed a reputation for quality production of artists in the Japan scene. Last week I had the chance to see Psychodream from Kobe performing live at Shinjuku Urga. This band has a unique sound, ranging from industrial, electronica through to avant garde alternative rock. Some of their music delivers an ambient soundscape, but if you turn your head for one second and out comes the metal percussion crashing into your sensorium! Yes, indeed, this band has a nice mix of sounds worth listening to. The band members consist of the enchanting MIYA Zombie on vocals and metal percussion, Damien electrifying on bass and Psycho Asada on guitar, metal percussion and behind the programming. This is the preliminary shout-out for the band as they build (or is that re-build) for activities across the nation. Expect to see their events posted on JGoth.com as the year progresses. In the meantime you can scout their sounds via MySpace and even download a song on their official Exblog site. Keep your eye on this band. Calmando Qual’s second maxi single since their comeback. The horror rock show constructed in their previous work, Doors, is given an even deeper expression in this release. Within its dark party rock style is a danceable avant-garde sound, and lurking behind its developing romantic edge is a twisted love story. After stepping through the Doors into the great hall that lies beyond, enjoy the party within to your heart’s content! A release event will be held at Ikebukuro Chop on November 20. Friday I got Psydoll on my mind! All righty folks. Igor’s gonna be dressed in a suit and all, especially for Friday night’s Psydoll gig. Well, I have to wear a suit on Friday so I don’t have any choice in the matter, but still… Psydoll, The Royal Dead and Psychodream – Awesome. If any of you folks out there are rocking up to the night feel free to hassle out the suit. Or better yet, let the bands know that Igor @ Jgoth.com sent you! Fancy a bit of dark indie J-rock? Then this night should have you gamboling in the dance pit. The Lechery from Mara is a frenetic punk rock act with Gothic undertones and have played a number of evil events in Tokyo. 13th Moon is a darker shade of hard Gothic rock with an infectious beat. For those with a penchant for Clockwork Orange, the droogs from Hat Trickers’ style of punk should whet your appetite. Finally there is the sultry alternative rock from Royal Cabaret. There are also other acts due to join in making for a pretty kewl event. 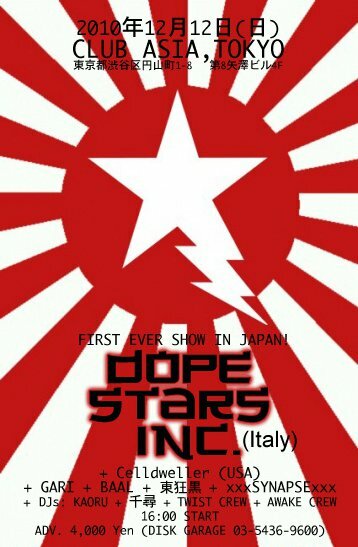 There is a 1,000 yen premium for ticket sales at the door so pre-booking with one of the bands is recommended. Live: The Lechery from Mars, 13th Moon, Hat Trickers, Royal Cabaret and more. Here is a nice Gothy event towards the end of the month. This overnight event is a showcase of artists from the Darkest Labyrinth label created by Blood and GPKISM guitarist Kiwamu. The night features six bands including GPKISM, Seileen, Vanished Empire and BLAMHONEY. It will also be populated by hot underground DJs Takuya Angel, Chihiro and Sisen. In terms of caliber of the artists this event would approach the levels of Tokyo Dark Castle, although the ambiance would tend to be a little softer than TDC in Igor’s opinion. Considering the rapid rise of Darkest Labyrinth and its high production values, the label’s events will become an important part of the Gothic landscape of Japan in the near future. Overall, this is definitely an event worth staking out. As with all overnight events it is important (i.e. absolutely VITAL!) to bring a photo ID with you for entry. Basically, without ID you will not be able to get into the club – which will make for a pretty dreary time!